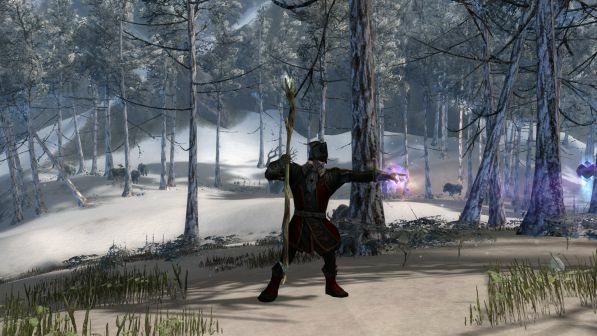 Guild Wars 2’s Mesmer class is… odd. Esoteric. Atypical. Weird. Bizarre. Not the ordinary. And, with an appropriate strangeness, it’s really quite compelling. Instead of being an out and out mage type, it’s all about misdirection and trickery. 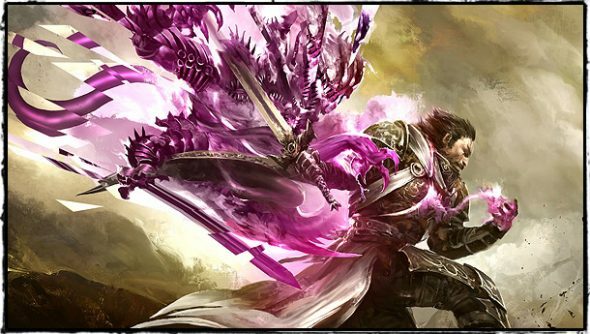 In fact, more than any other class in any other MMO that I’ve ever played, Guild Wars 2’s Mesmer is the closest thing I’ve played that feels like a magician. It’s even got a skill called ‘The Prestige’. The clues are there people, you just need to look for them. The big flashy feature that is always introduced when you hear talk of the Mesmer is the illusions, and how they’re used to disorient, confuse, daze and damage your opponents. They’re great, they really are. There’s nothing quite like having three clones of yourself all doing different types of weird mind-based attacks on your enemy, and when they get proper cohesion, like with the Staff, they start to feel truly powerful. Add to that the ability to ‘Shatter’ them at any time, ordering them into a suicide charge at the enemy to explode themselves on the target to cause a range of effects (depending on which F key you decide to bash) and they become the central mechanic to structure your play around. While the illusions are all very clever and interesting, the real hook is in how they’re created. Each weapon set has a different mechanic for this, and they’re almost always about getting you away from the centre of attention and having your clones take the hits. Or for you to take the hits while your clones absorb the damage. Like I said, weird. Take the Greatsword. In the hands of a Warrior it’s all about crowd control and big, grandiose swings that make pretty much everyone want to think twice about getting close to them. In the hands of a Mesmer the Greatsword suddenly becomes a long range laser beam, something to suspend between your hands and spin fast enough it hurls psychic energy at your enemies. The further away from your opponent you are, the more damage that beam does. So all of your skills are about maintaining distance, even if only by giving your opponents a reason not to charge you down, with one ability letting you hurl your sword at enemies, having it bounce from target to target before creating a phantasm at the final destination. Or there’s the Beserker Illusion, who just flings himself in a whirlwind at your targets. And then there’s a massive cleave that has huge knockback, giving you space to start laying down the damage again. Conversely, if you have a sword in each hand, you’re all about getting up close and personal. You’ve got your basic combo that conjures an illusion every third swipe, a flurry attack, and then a pair of really odd Illusion creating powers. One sends an Illusion jumping at your target from a distance, with the option to then teleport to where it landed, and the other sends youjumping, leaving a clone in your place. Somewhat useless in PvE, but it’s going to wreak havoc in PvP with people trying to figure out exactly which is real. effects, and you’ll see a theme emerge. Brilliantly, there are enough utility powers that they’re always going to compliment whatever weapon set you pick. Go with a Sceptre and Pistol, and you want to keep as much space between you and your target as possible. So something like a Blink, letting you put some instant distance between you is excellent. Or, on the other hand, if you want to get some more Illusion goodness you could always go with a Decoy, that lets you gain stealth, leaving a new Illusion in your place. Distracting /and/ distancing. Nice. But then if you do go with two swords, you’re going to have to have the health to back that up, and a Phantasmal Defender, which absorbs half your incoming damage, is going to be almost a necessity. Or maybe you /do/ want to be able to teleport around with Blink, or plant some Decoys so that you can get that moment’s respite so you can cast your heal. Guild Wars 2 lets you build the way you want to, and the variety of skills, and more importantly their cohesion with one another, even across dual wielding sets, means that you’re always going to be spoilt for choice. As for the Mesmer itself, it’s a class that was always going to be one of the harder ones to properly nail down, especially in something as brief and condescend as a Beta Weekend. Of all the classes, it seems like the one most reliant on other players, as it thrives on /not/ being the centre of attention, instead landing all of these negative conditions on the targets that it picks. The only major problem that I faced in the fifteen or so levels that I played of the class was the fact that the illusions you create shatter the instant your target dies, as they’re cast on each target. When you’re facing dozens of weaker, smaller foes they’re rendered mostly useless, as while their shatter effects are powerful, their moment to moment damage is negligible, for the most part, leaving you with constantly created, but vastly useless, illusions instead of something that can handle AOE. But, like all of Guild Wars 2’s classes, they’re wholly unique within the game. They’re not the raw power of the Elementalist, or the more subtle but equally devastating pet-play and damage-over-time of the Necromancer. They don’t even feel like a different brand of the same umbrella class, even though they’re nominally a caster. They don’t stand at the back, firing off nukes and praying that they don’t get singled out by one of the enemy rogues, or charged by an opposing Warrior. 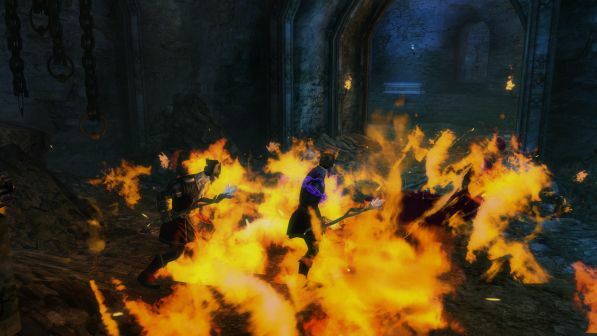 They’re right there in the thick of it, throwing up illusions, stabbing at giant Charr with dual swords, or blasting away with a pistol in the offhand. Or, if you want, I suppose they could be that far away nuke, except they’ll be using a bloody great two handed sword, rather than a Staff. Or, well, they could be using a staff. That’s not the point.